The "longest, continuous tree ring-based diary" is being created by scientists at the University of Cambridge to help map climate change. "The biggest advantage of tree ring chronologies is their annual precise dating, so this allows us to make cross-comparisons to human history," said Prof Büntgen, head of the university's tree ring unit. "Trees are unique in the way they form each year an annual distinct ring... so this allows us to make these continuous chronologies. "By being able to map past climate changes over 1,000 or 2,000 years, we can ultimately improve modern predictions." Living trees and samples from building sites, medieval churches, lakes and peat bogs are being used. Trees - preserved for hundreds of years - have also been winched out of Scottish lochs. 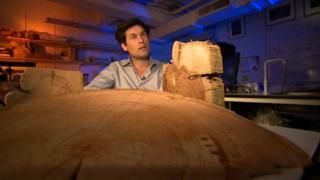 "We have material for Scotland going back 8,000 years," said Dr Rob Wilson, of the University of St Andrews. "We've got lots of gaps at the moment... we have an 11th Century gap and then we've got a lot of material for the first millennium AD." "[Rings can reveal] earthquakes, rock avalanches, snow avalanches, tsunamis... so one can be quite creative in the different aspects of environmental change you can study with tree rings."